Leaders in the fashion industry agree, fur is a relic.. There is a large and growing fur-free fashion industry. Canada Goose’s claims of “humane” fur are all marketing. It can take killing more animals than you think to make one fur coat. 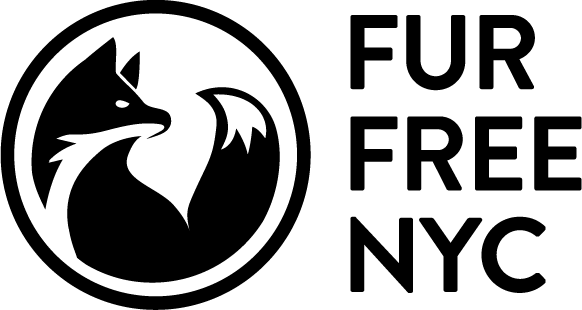 The countries most respect and well-known animal charities support a fur-free NYC. Commissioner. The term “commissioner” means the commissioner of consumer affairs. Fur. The term “fur” means any animal skin, in whole or in part, with the hair, fleece or fur fibers attached. Fur apparel. The term “fur apparel” means any article of clothing or fashion accessory, to be worn on any part of the body, made of fur, in whole or in part. Used fur apparel. The term “used fur apparel” means any fur apparel that a natural person has acquired for that person’s own use as an article of clothing or fashion accessory. § 20-699.11 Prohibited conduct. No person may sell or offer for sale any fur apparel except for used fur apparel or fur apparel made from fur sourced exclusively from used fur apparel. § 20-699.12 Penalties. a. Any person that violates section 20-699.11 on or after the first day of May next succeeding the effective date of the local law that added this subchapter shall be subject to a civil penalty of not more than $500 for that person’s first violation and each additional violation occurring on the same day as the first violation, and not less than $500 nor more than $1,500 for each subsequent violation. Violations shall accrue on a daily basis for each item of prohibited fur apparel that is sold or offered for sale. b. Any fur apparel offered for sale or any revenue generated from fur apparel sold in violation of section 20-699.11 shall be subject to forfeiture upon notice and judicial determination. § 20-699.13 Injunctive relief. In addition to any other relief available by law, the commissioner may seek any relief available under article 63 of the civil practice law and rules in a proceeding against any person alleged to be in violation of any provision of this subchapter. § 2. This local law takes effect 90 days after it becomes law, except that the commissioner of consumer affairs shall take such measures as are necessary for the implementation of this local law, including the promulgation of rules, before such date.